TEXAS -- "He was blind. He didn't stand a chance. A little Rat Terrier and two dogs like that. 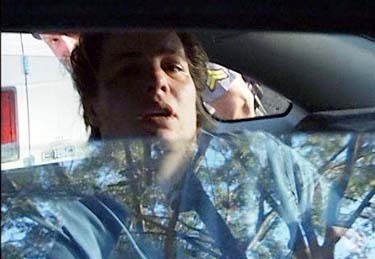 He didn't stand a chance," said William Cox. Cox is talking about his eight and a half year-old blind Rat Terrier and the dogs that attacked them. On September 30th two pit bulls brutally attacked Cox and his dog, killing the Terrier and wounding Cox. When asked if any criminal charges should be filed against the owner, Javance Johnson? "As of today we have just a couple of things left to do on the investigation and we should have it ready to go by tomorrow," said Director of Lubbock Animal Services, Kevin Overstreet. "They made no effort to help us get the dogs off," Cox said about the dog owners. 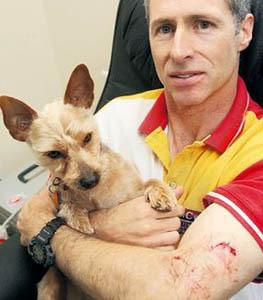 During the attack Cox suffered a broken arm, puncture wounds to his other arm and a broken finger. "They were vicious," Cox added. The dogs, deemed dangerous, were scheduled to be put down this past Friday but Lubbock Animal Services has not been able to reach the owners. "I postponed it because we were not able to verify that the owners of the dogs had been notified through certified mail," said Overstreet. "Apparently he (the owner) doesn't care about my condition or his consequences," said Cox. But Cox does believe action will be taken. "They will be put down because the dogs has been in trouble too many times before," added Cox. FLORIDA -- One thought raced through Susanne Tenney's mind as two pit bulls attacked her in an Oakland Park neighborhood Monday - she had to protect her dog. The animals surprised her as she walked Zydeco, her 11-year-old greyhound, through the intersection of Northeast Second Terrace and 53rd Court. Tenney jumped on her pet to shield her, but the pit bulls mauled the dog, which later had to be euthanized. Tenney and a man who tried to stop the attack were also hurt. "They were biting us everywhere. They were too quick," said Tenney, 45, of Northeast Fourth Terrace. The pit bulls escaped through a gap in the fence of a nearby yard, said Andrea Voss, a spokeswoman for Broward Animal Care and Regulation. "I heard a loud scream, and I knew something was wrong when I went to check it out," said John Clark, 55, who lives a few houses away from the intersection. Clark said it was pure instinct that drove him to help Tenney by fighting off the dogs with his bare hands. He yanked away one of the dogs, a tan male, but the other turned and bit him. Every time he tried to subdue one, the other would bite. "It felt like I was there 50 minutes," Clark said. "They were biting me hard, but I knew if I let them go, they'd turn around and bite the lady." Other neighbors rushed to the scene, one carrying a bat and another carrying a sledgehammer, Clark said, though they didn't get to use them. Clark lifted the male pit bull by the collar and pinned him down, giving one of the neighbors time to tie its legs with a clothesline, he said. The other dog, a tan and white female, ran back to its owner's house. Officers from the Broward Sheriff's Office and Animal Care and Regulation captured the dogs soon after arriving at the scene. A police report said the dogs belonged to Maria Giannelli, 39, who lives with her family near the end of Northeast Second Terrace. She could not be reached for comment Monday. An ambulance took Clark to North Ridge Medical Center, in Oakland Park, but Tenney refused to be treated there. She took Zydeco to Hollywood Animal Hospital on a blanket provided by one of the neighbors and then went to Holy Cross Hospital to have her own injuries treated. 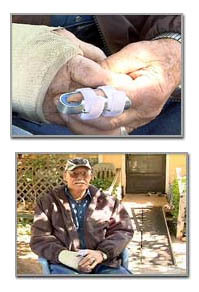 The dog's injuries were severe, and Zydeco had to be euthanized. "My dog's not with me anymore," Tenney said, a large bandage on her face and her hands covered in gauze. "I never thought this was how I was going to lose her." The pit bulls were taken to an animal shelter where they will be quarantined for 10 days before they're euthanized, Voss said. 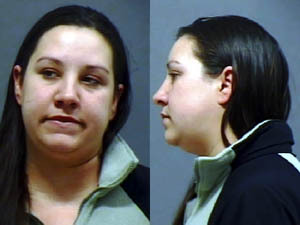 OREGON -- Hillsboro Police say they have arrested a woman for a case that involved the abuse of a small pit bull puppy. Thirty-year old Shannon Lee Shelton of Hillsboro was taken into custody today for Animal Neglect-2, and Initiating a False Report. Lt. Michael Rouches with Hillsboro P.D. says this case stemmed from Shelton bringing her 6-month old pit bull puppy to the Bonnie Hays Washington County Animal Shelter last week. "The dog was very thin and had ammonia burns on it's paws and legs. Through a cooperative effort with Washington County Animal Control, Officers from Hillsboro Police began an investigation. Shelton claimed that she had found the dog at Shute Park in Hillsboro." rambunctiousness so she ignored it. The dog is at the Bonnie hays animal shelter, Rouches says, and is doing well. Hillsboro Police arrested her for Animal Neglect-2, and initiating a false report. WASHINGTON -- Two rural Aberdeen residents have been charged with misdemeanors for not properly caring for their dogs. Leonard C. Sollie, 58, and Karla J. Sollie, 59, each face six counts of inhumane treatment of animals. Each count is punishable by as much as a year in county jail and a $2,000 fine. In June, the Aberdeen Area Humane Society informed law enforcers of possible animal abuse. They responded to the Sollie home west of Aberdeen. 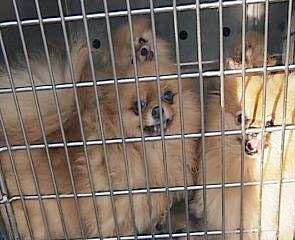 The dogs were surrendered willingly by the Sollies. Lori Ehlers, a deputy state's attorney for Brown County, said 29 dogs were ultimately taken from the Sollies. Eight of the dogs were feral/wild, Ehlers said. Kayla Beard of the Aberdeen Area Humane Society said the dogs were malnourished and covered with ticks and fleas when they were taken into custody. She said the dogs also had dirty kennels. Beard said most of the dogs were sent to Humane Society sites in Sioux Falls or Huron. One, a Great Dane, was kept in Aberdeen and was recently adopted, Beard said. She said one of the dogs was so sick it had to be euthanized. The scheduled magistrate court date for the Sollies is Oct. 10, Ehlers said. LOUISIANA -- SHAUNA ELAINE JENKINS, 38, 7233 ANNABELLE, was arrested this morning and charged with 1 count of Felony Theft by the Baton Rouge Police Department. She was also issued a misdemeanor summons by East Baton Rouge Parish Animal Control for 38 counts of Cruelty to Animals and other charges relating to the licensing and vaccination of the dogs. Jenkins is accused of accepting a $5000 payment for purchase of a Pomeranian dog from a broker in New Hampshire (on behalf of a buyer in Australia), but ultimately failing to provide either the dog or a refund. The payment was made and accepted in December 2006.
the Baton Rouge Police Department in August 2007. 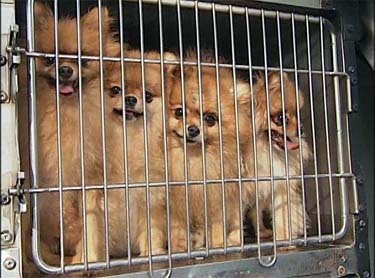 This morning when officers went to Jenkins’ home to question her as part of the ongoing theft investigation they discovered 38 live Pomeranians and one dead one inside the home and in a semi-detached storage room. East Baton Rouge Parish Animal Control Officers were called to the scene and took possession of the animals. Center (Director Hilton Cole) at 225-774-7700. UNITED KINGDOM -- An Ulster man who was badly bitten by a large dog spoke last night of his fears during the frenzied attack and said that even legally owned animals can be dangerous. Housing officer Jim Allison was walking his puppy near his home at Stockman's Lane in south Belfast around 9.30am on Sunday when he was savaged by a Japanese Akita fighting dog. The 48-year-old suffered severe bites to both arms that required stitches, as he sought to protect his small Yorkie, Scruffy, from the ferocious animal. Speaking to the Belfast Telegraph last night, Mr Allison said that if it hadn't been for a neighbour, his injuries could have been much worse. "I saw a Japanese Akita fighting dog coming towards us," he said. "It weighed about eight stone. It went for my throat. I put up my left arm to protect myself. Meanwhile, I was holding the puppy on its lead off the ground with the other arm. "It tried to reach down and get the puppy, but somehow I managed to get into a neighbour's garden. Just as the dog was coming over the gate a man opened the door. I jumped in and slumped to the floor. I thought my arm was broken." Mr Allison said that a passing motorist, who witnessed the attack and stopped his car, was unable to help because the dog then made a lunge at him while he was in the vehicle. "He couldn't get out," explained Mr Allison. "But at least that gave me a few seconds to get to the house - and to safety." He added: "It had already done a lot of damage. My upper right arm was ripped open and I damaged a muscle and had puncture wounds beneath the arm." Mr Allison, who practises martial arts, said that this type of incident underlined the dangers that certain dogs posed. "If that dog had attacked one of my nephews he would have been dead," he said. "I think people should be aware of what these dogs can do and I think owners need to take more responsibility for their dogs." A PSNI spokesperson confirmed that officers and ambulance personnel arrived at the scene shortly after the attack. USPCA official David Wilson - who removed the dog from the area and took it to kennels run by the organisation in Carryduff - said that this is just the latest in a number of similar attacks. "An Akita is not a dangerous dog in terms of the law, but it requires an owner who is aware of its needs," he added. "They are not like American pit bull terriers, but they are big dogs that need careful, responsible handling." The Akita - bred for hunting bear and deer in Japanese forests - is not a banned breed in Northern Ireland. Five months ago, in April, a 73-year-old Carrickfergus man was walking two Yorkshire Terriers when he was set upon by an Akita.